The tagline for the 2012 BMW 3-Series Convertible is “365 Days of Driving Pleasure”. This is a bit of a hard tagline to beat, because it certainly does sum this very fun BMW 3-series up. This car isn’t about practicality and getting from A to B. Instead, this car is more likely to agree with the old saying that it is better to travel hopefully than to arrive – or should that be travel joyfully? Come to think of it, “fun” isn’t quite the right word for the BMW 3-Series Convertible. “Fun” tends to be reserved for small hatchbacks. Other words that could be more appropriate for the BMW 3-Series Convertible could be “carefree” and “exuberant”. “Enjoyable” would be a bit of an understatement. The BMW 3-Series Convertible is made for those who like driving and consider it more than just a way of getting to your destination. After all, that’s what a convertible is all about. So what has the BMW 3-Series Convertible got to ensure that you do get a great trip every day of the year? Well, obviously, the car can take its top off so you can feel the wind in your hair, and the body has been carefully designed so that even when the hard top is neatly packed away (which it does in less than half a minute), it is still recognisable a BMW and simply oozes European style. If the weather doesn’t seem to cooperate with your plans for open-top motoring, press the button again and the hard-top comes up as quickly as it went away. And then you can rely on the automatic air conditioning with fog and solar sensors to keep you at the right temperature. Those bi-Xenon adaptive headlights just about seem to wink at you if you look at the BMW 3-Series Convertible head on, and they do exactly that , more or less, at night time thanks to the high beam assist function. The interior trim of the BMW 3-Series Convertible is glossy black against the Dakota leather, unless you’ve got the 335i M Sport version, in which case, it will be silvery aluminium. Naturally, the style of the BMW 3-Series Convertible is so good there are more than just two to choose from. We’ve already mentioned the 335i M Sport variant, but you can also choose from the 325i, the 320d and the 330d, the latter two of which are turbodiesels. How to choose between them? Well, as you would expect from anything from BMW with an M on it, the 2012 BMW 3-Series Convertible 335i M Sport is the pick of the bunch, as it’s got the hottest engine (225 kW of power, 400 Nm of torque and a 0–100 km/h time of 5.8 seconds) and it’s also got the best-looking collection of bells and whistles – it’s got the 19-inch double-spoke 313M alloy wheels, the M-Sport suspension, the Sport seats and the M leather multifunction steering wheel. At the other end of the line-up, you have the BMW 3-Series Convertible 320d. The powerhouse in this car can manage a decent enough 135 kW of power and a grunty 380 Nm of torque (diesels are always a bit more “torquative” than petrol units) and does the 0–100 km/h sprint in 8.3 seconds. However the 320d doesn’t have the pullaway assistant that the other three do, it has the smallest wheels (17″ alloys), it has black kidney grille slats up front instead of chrome, the cruise control doesn’t have braking function and it has the Business navigation package where the other three have the Professional deal (means a smaller display screen). It also has the Auto Stop/Start function that switches the engine off if you’re still for too long – no more wasting petrol while you wait for your passenger to shut the gates and get in with that function; the other three variants of the BMW 3-Series Convertible don’t have this function. The same goes for the optimum shift indicator. The other two 2012 BMW 3-Series Convertible variants (the 325i and the 330d) have their unique points, too. 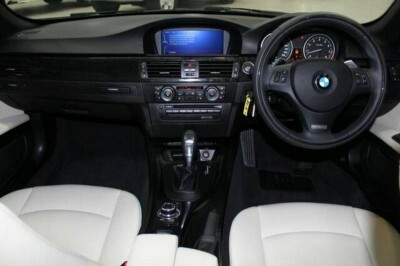 For example, the 330d is the only automatic among the standard versions, and it has steptronic gearshift paddles on the steering wheel. The 330d also shares the front and rear park distance control with the 335i M Sport, with the other two only having rear park distance control, and these two “double threes”, as you could call them also have lumbar support in the two front seats, and the surround sound system. What’s unique to the 325i is the engine and the sound system – 225 kW for the former and 180W for the latter. Both the mid-range variants of the BMW 3-Series Convertible have 18-inch alloy wheels and chrome line trim on the exterior. And the engines? The 330d has the most torque out of all the variants of the BMW 3-Series Convertible at 520 Nm (and 180 kW of power) and the 325i hits the top of the power and torque curves at 150 kW and 250 Nm respectively. It’s nice spending time in a BMW 3-Series Convertible. Comfortable seating and wind in the hair is all very stylish! But there are some things that all four types of 2012 BMW 3-Series Convertible have in common, and it’s good to see that safety is never compromised to drop the price and distinguish between them. All four have the rollover protection system, the ABS brakes, the cornering brake control, the dynamic traction control, the full set of air bags, the safety body shell, the pretensioned and force-limited seatbelts and the active head restraints. Also, in all examples of the BMW 3-Series Convertible, you’ll find the rain-sensing headlights, the electrically adjustable front seats with memory for the driver, the Bluetooth preparation and the USB input on the radio/CD sound system. 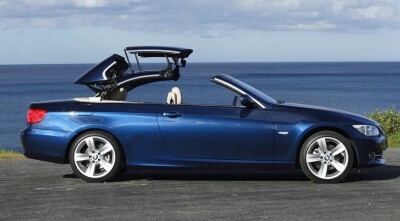 So which sort of 2012 BMW 3-Series Convertible sounds like your idea of fun? It’s a bit of a hard choice. Why not take all four for a test drive? After all, research is always a good idea, even when it’s a pleasure. For any more information on the BMW 3-Series Convertible, or for that matter any other new car, contact one of our friendly consultants on 1300 303 181. If you’d like some fleet discount pricing (yes even for private buyers! ), we can submit vehicle quotes requests out to our national network of BMW dealers and come back with pricing within 24 hours. Private Fleet – car buying made easy!